Nevertheless, I must tell the world that today I ran a decent distance for the first time, three miles. The knee felt odd at first, though I think that is partly the bandage, but I lasted. I had a place in the Newick Will Page 10k today, but I thought a 10k might be a little too much, at least for now. I have a place in the Hellingly 10k, two weeks hence, and hope to be fit enough by then. I return to the nurse on Tuesday. I hope she will remove my bandages for the last time and give me permission to swim. Nearly five weeks after my fall, this morning I ran again for the first time; not much, a mere two-thirds of a mile, but a run nevertheless. It felt strange, not painful but I was very conscious of the knee and its movement, perhaps because there's still an enormous silver colloid dressing on it. I have never worried much about running style, but I found myself thinking about how my legs moved, and whether I was running correctly. Normally I don't trouble myself with such refinements. Twelve hours later, my leg has not fallen off, and so I think I shall try again, and start building up the distance. While not running, I've had plenty of time to observe the post-Olympic debate. I've hesitated, not wanting to be crushed to death under the bandwagons' wheels. However, since anyone and everyone has an opinion, here's mine, and some account of its formation. poor performance punished with the slipper. How exactly was this supposed to motivate us? And on the thirteenth it will be a month since my fall. I still have not run, which is poor. The knee is painful, stiff and swells. My stigmata, the wounds on the palms of my hands, are still there, and make me wonder if I should start a new religion. Meanwhile I watch these extraordinary Olympics. I realise that the thing my running lacks is a gesture, a pose, to serve as my trademark. Usain has his bolt, Mo Farah his mo-bot. What should mine be? I have time to find the answer. 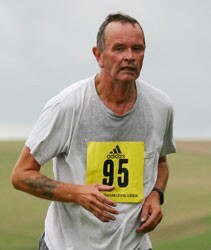 My next race is the Will Page 10k in Newick at the bank holiday weekend. I shall start running again in time to perform.